Afzal Guru was hanged for his role on 2001 Parliament attack on February 9 at 8am in the Tihar Jail complex where he had lived in a solitary cell for many years. NEW DELHI: Hours before he was to be executed, Afzal Guru penned his last letter to his wife, Tihar Jail officials said on Monday. The letter, written in Urdu, was posted on Saturday but is yet to reach his wife in Kashmir. Speaking to IANS, officials at Tihar jail said that Afzal Guru, convicted for his role in the 2001 Parliament attack, was told on February 8 evening that he would be hanged the next morning. “When he was told about his execution, he was cool and calm. He just expressed his wish that he wants to write a letter to his wife. The jail superintendent gave him a pen and paper,” an official told IANS under condition of anonymity. “He wrote the letter in Urdu, which was posted to his family in Kashmir on the same day,” the official said. However, when IANS contacted the family, who live in Sopore, they said they are yet to receive it. “We haven’t received this letter. Maybe like the letter that we got today about his hanging, we will get it later,” Yaseen Guru, Afzal’s cousin, told IANS on phone. 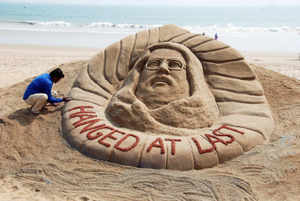 Afzal Guru was hanged on February 9 at 8am in the Tihar Jail complex where he had lived in a solitary cell for many years. His family has demanded that they be allowed to conduct his last rites. “The government will take a decision in this regard,” another official told IANS. Afzal Guru, who used to spend his time in the jail by reading and writing, has left behind many books and hand-written articles. The family has asked the jail authorities that all his belongings should be returned to them. “The government will have to take a decision on this issue,” the official added.